With a stay at Beach House Imperial Laguna by Faranda Hotels in Cancun (Avenida Kukulkan), you'll be minutes from Cancun Golf Club at Pok Ta Pok and close to La Isla Shopping Mall. 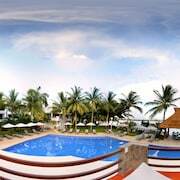 This hotel is within close proximity of Plaza Caracol Mall and Chac Mool Beach. Make yourself at home in one of the 62 air-conditioned rooms featuring refrigerators. Rooms have private balconies. Satellite television is provided for your entertainment. Bathrooms have showers and complimentary toiletries. Take advantage of recreation opportunities such as an outdoor pool or take in the view from a rooftop terrace and a garden. Additional amenities at this hotel include complimentary wireless Internet access and concierge services. Satisfy your appetite at the hotel's restaurant, where you can enjoy drinks at a bar and dine alfresco (weather permitting). Snacks are also available at a coffee shop/cafÃ©. Quench your thirst with your favorite drink at a bar/lounge.